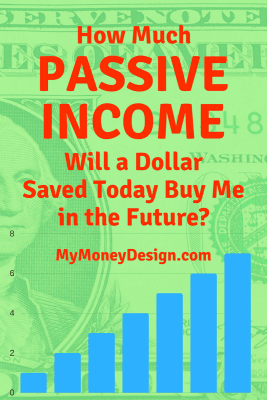 How Much Passive Income Will a Dollar Saved Today Buy Me in the Future? 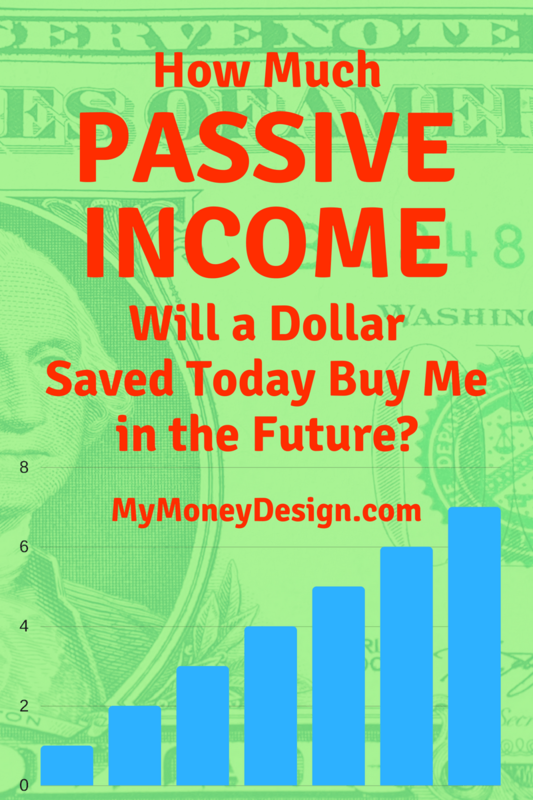 Can you “buy” passive income? Of course you can! Essentially this is the whole point of saving your money and stashing it away for financial freedom (or retirement). “A dollar saved is a dollar earned” … or so the old saying goes. How much is a dollar saved really worth in 10, 20, or even 30 years? Or to be even more practical, how much financial freedom can this dollar actually produce for me every year in retirement? In this post, we’re going to go through an analysis of the savings process and see just exactly how much each dollar translates into the future. My goal: After reading this post, I want you to be able to associate some known value to each dollar saved. But first, let’s see how it all fits together. Tomorrow I have a dollar to spend. But of course we know we can do better! By investing and letting compounding returns work their magic, we can start making money from our money. Eventually this will build into a pile of cash so large that we could withdraw a small amount of it every year, and the pile will never deplete. To illustrate this point, let’s imagine you put $1,000 into an investment account, and put it all into a simple stock market index fund. We know from sources like Vanguard and NYU that overtime this stock market index will return approximately 10% annually. If we adjust for inflation (approximately 3% per year), what will this $1,000 be worth after 10 years? In other words, it potentially could be worth double what you started with! What if we wait 30 years? Now how much will our initial investment be worth? … approximately seven and half times our original value! 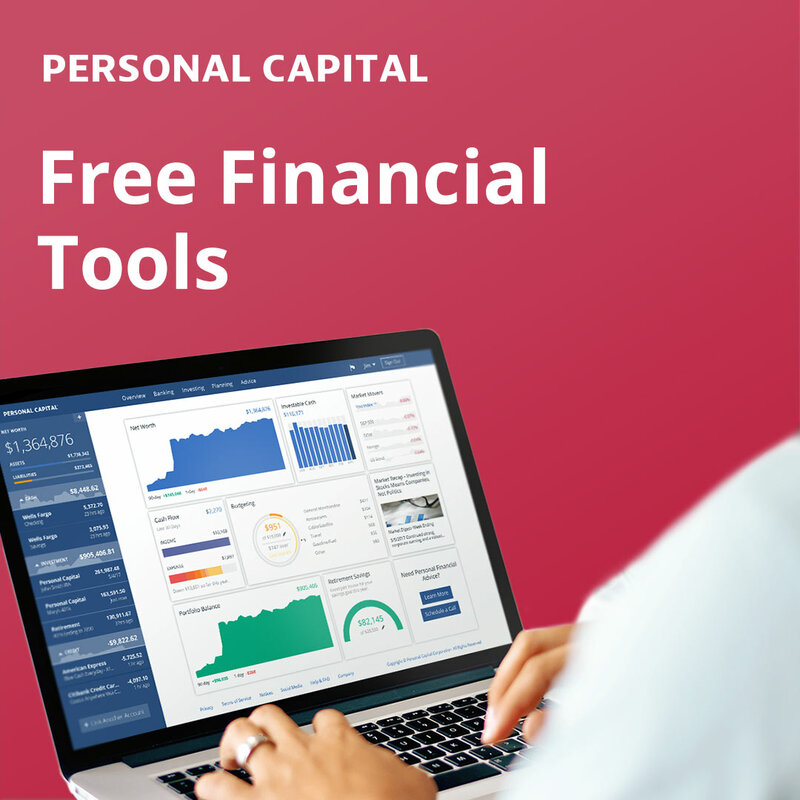 So without doing anything, no fancy investment strategies, no checking stock tickers, and no real action on your part, you managed to create 7.6 times the value of your savings – just by allowing time to pass. By the way – Congratulations! You just beat over half of the so-called wiz-kid investors out there. But that’s not the end of the story. The real power hasn’t even occurred yet! What if we took our simple example to the next level higher, and made it so that this $7,612 pays us a “paycheck” of money every year for the rest our lives! We know from the research of William Bengen that the 4% safe withdrawal rule is a reasonable place to start. Basically what this rule says is that there is a very high chance of success that if we start by withdrawing 4% from our savings and continue to do so (inflation adjusted) every year, we will not run out of money. So, again, for doing nothing more than saving our money and allowing a significant amount of time to pass, we’ve created a steady and reliable stream of money that will continue to pay us for the rest of our lives! This is a very powerful concept because it quantifies just how important saving your money can be. Every dollar saved could grow to be an endless supply of money you pay yourself in the future! That’s definitely the road to financial freedom! To fill in the blanks for other time periods and illustrate this point further, here’s a graph of just how much $1,000 would produce for you each year after allowing it to grow for a set number of years. As you can see, depending on how much time you have to work with, there is a definite and real quantifiable benefit to each dollar being saved. 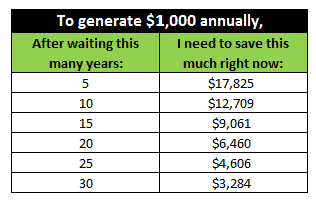 How much money do you need to save right now in order to make that happen? Using the same numbers and assumptions we just calculated above, we can work our equations backwards to find out how long we would need to save, and how much we would initially need to save. Again, this will give us some reasonable expectation as to how much our money would be worth after allowing it to compound for some finite amount of years. Again, this is really powerful stuff! To illustrate, let’s say a young professional tightens his budget and decides he’s going to save the full IRS 401(k) maximum of $18,000 this year. How much passive income will this generate starting in 30 years? Outstanding! One year of mega-savings just added $5,481 of future income for this individual! Keep that up, and it’s going to be a very luxurious retirement for this person some day! Obviously the numbers used in this example are for simplicity. There is never a guarantee that you will make money in the stock market. It goes up and down when it wants to. The stock market certainly never goes up at a real annual rate of 7% every year, and we only use that geometric average based on historical data. Also, different investment types would produce different rates of return. There is a very real and definite reward that comes with saving your money. Using a very simple investment method and being patient as time allows compounding returns to build, we can turn every dollar saved into future passive income. 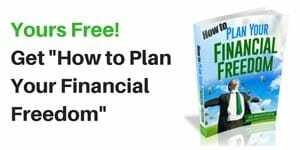 Multiple this fact across years of savings, employer contributions, and tax-sheltering, and you can easily and systemically build your way to a bright and prosperous financial future. Readers – How do you quantify the value of a dollar saved today? 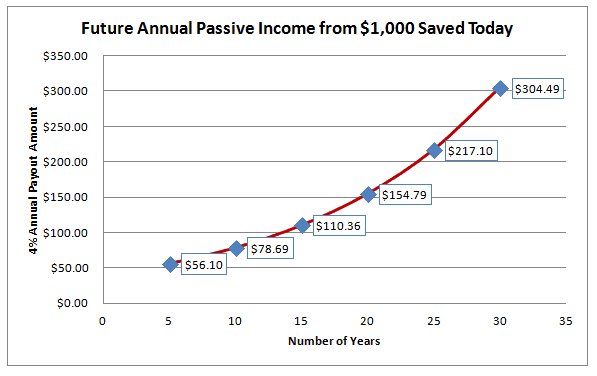 How much future passive income do you think your savings will be worth one day? Great article, MMD. Many people don’t save or invest because the goals and returns are too abstract. A lack of a clear finish line equals a lack of an end, and who wants to save their money indefinitely? It’s important to note that saving means nothing without investing. If you do the former without the latter, you are just letting inflation erode your purchasing power. So good call recommending an index fund rather than a bank account. I do wish compound interest was taught more in school. I don’t think most people understand the concept at all, although with all the calculators and information available, that really isn’t an excuse. Compound interest is really great to make those future goals do come true MMD. And, it is a passive income that I want to have. It is better to save and invest nowadays. It goes to show that time and compounding do more than actual contributions. I just transferred another 3200 into my Roth IRA because of this post. Haha. Every little bit helps. I’m going to count saved dollars as passive income by saving for a rental house (once we take care of our own mortgage). That way, every dollar spent there will end in decades of passive income! Because of your post MMD, I remember the quote “Have the courage to set down every penny you spend, and add it up weekly.” This is by Josephus Nelson Larned. I think we have to start today if we want to have a better and improved retirement life. Now, I just want my savings to compound as much as possible. I am planning to make it compound quarterly rather than annually when I am saving money. That said, I think compound interest is a double-edged sword especially when I borrow money. This is very inspiring! Now I know my money’s worth. Saved dollars are certainly passive income. Knowing makes it that much better. Welcome to the site Jackie B! Great article, we hear it again an again but you word it in a simple ways that is easy to grasp. Very powerful point you make here! I used to say that with each dollar that passes through our hands we choose between spending it now or later (i.e., saving it.) But you’ve made me realize I’ve been wrong. We’re actually choosing between spending a dollar now or ~seven dollars later! Thanks Kurt! I really appreciate the compliment and the tweet. Honestly after writing this post, I can’t help myself from wanting to hang on to every single dollar – knowing what it will mean for me in the future! Compounding truly is incredible! Thanks, and welcome to the site. My 8 year old thinks that compound interest is magic. It’s about as darn close as you can get! He is already excited to start investing. With a 50 year time frame, his little bit of savings can really grow. Ah! The wonder of youth! 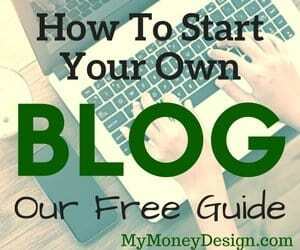 Watch out, you might have a future personal finance blogger on your hands. My amazement with interest and the fact that I could make dollars appear out of nothing is where I got started. Nice article, but I’d not assume 10% per year return. Even the most optimistic forecasts say 7-8% expected before inflation. That’s why the 4% rule is being attacked recently. I’d safely redo the math assuming a lower return. Thanks, and I may try that out. I only did the math based on previous historical returns as an illustration. Quite frankly, when talking about the future, I never listen the forecasts. If I did, I would have missed out on the last 8 years of the bull market! Also, sorry to correct you , but the main reason that people attack the 4 percent rule as of recently is because of the bonds, not the stocks. The loudest skeptics (Pfau, etc) are saying that due to the interest rates being historically so low for so long that we are entering into un-charted territory. Their argument is that if you did the same analysis with today’s rates, 4 percent would not work.